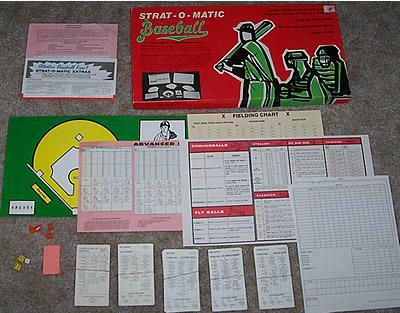 Strat-O-Matic Baseball was first introduced in 1961, making it the second longest running active baseball game on the market (next to APBA). Stratomatic Baseball has a large following and a number of gaming leagues as well as groups on the internet. Two versions of the game are offered; a basic version and an advanced version. The basic version is geared towards newer players and games can be played in about 20 minutes. Individual player cards are provided and three dice are used to guide you through the pitching, hitting and defence. Despite being a basic version, you still get to decide all the basic strategy moves such as sacrifice, steal, hit and run ... The advanced version is for more seasoned players and only takes about 30 minutes to complete a game. Additional effects for the advanced version include stadium effects, left-right effects for both pitchers and batters, fatigue effects for pitchers and clutch hitting. The mechanics of Strat-O-Matic seem to be an improvement over the APBA game system. While the advanced version of the game takes into account left-right interaction, this game is just not as fun as Statis Pro Baseball. Strat-O-Matic is also available for the computer. It has the advantage over SBS in that it does take into account left-right effects for both pitchers and batters. However, APBA is not as fun to play and it is not free.